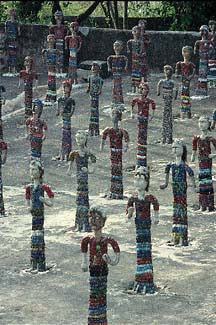 In 1997 Nek Chand made a tour of the USA, taking part in presentations and exhibitions on the Rock Garden theme. His one-month journey took him to Wisconsin, Chicago, Washington and Baltimore and across the nation to Los Angeles and San Francisco. On his return to Chandigarh he discovered to his horror that widespread vandalism had taken place at the Rock Garden in his absence. Furthermore, the destruction appeared to have been organised and deliberate. He found that all the staff working and caring for the Rock Garden had been removed by the Chandigarh authorities shortly after his departure, thus leaving everything completely unguarded and vulnerable to anyone who wished to cause damage. There has often been an uneasy coexistence between the intuitive humble genius and the powerful forces of authority in Chandigarh. When Nek Chand’s magic kingdom was first discovered it should, by rights, have been destroyed. It was built illegally on government owned land, in violation of strict planning laws that protected Le Corbusier’s 'City Beautiful', where everything had to be a part of the great master plan. Many politicians demanded the Rock Garden's destruction as an illegal development. Others, following public opinion and their own tolerant enlightenment, ensured that the Rock Garden became a well funded public park. Nek Chand was relieved of his duties as a government roads inspector and given a salary to continue with the expansion of the Rock Garden with the title 'Creator-Director'. In addition the City authorities funded a force of fifty labourers to help install all his sculptures in the mosaic courtyards of the Second Phase. However, over the years the support from the City gradually ebbed away. Certain officials resented Nek Chand’s international fame. After all, he was a humble man from a lowly background. How could he be as important as they were? From 1988 onwards funds dried up, with even the admission money being withheld. In 1990, a road for the exclusive use of VIPs was to be built right through the middle of the Garden. Trees were cleared ready for construction and bulldozers arrived at the very walls of the Rock Garden, only to find their way barred by hundreds of children and demonstrators. A lengthy court battle ensued, eventually resulting in victory for a by now exhausted Nek Chand and giving him the security his Rock Garden needed but with little or no funding. The outrage of the 1997 attack galvanised Chand’s international supporters. Nek Chand himself stated that 'The vandalism was not directed at the sculptures but at Nek Chand, as they very well know that my heart and soul lives within them'. Authorities in India received hundreds of letters from around the world. A school in Little Rock, Arkansas USA sent children's pictures with messages urging the authorities to save the Garden. The following year saw the formation in London of a new official charity, the Nek Chand Foundation. With initial funding from the Paul Hamlyn Foundation, Sara Burns, who founded the NCF with John Maizels, travelled to India to hold high level negotiations with both local and national politicians. Gradually the Foundation was able to have an effect on the way Nek Chand was perceived by officials in Chandigarh. Before too long the corrupt Chief Engineer who had withdrawn the Rock Garden staff was arrested and other officials fled retribution, one even being murdered by opponents regarding another corruption case. 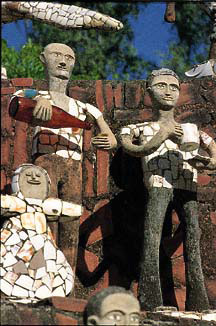 Nek Chand had vanquished his enemies and the Chandigarh Authority handed over management of the Garden to a specially formed local charity, the Society for the Maintenance and Preservation of the Rock Garden. However, it was still some years before even this new body was willing or able to give the full support needed. Although all gate money was now supposed to be released for Rock Garden development and maintenance, a huge backlog of withheld funds built up. It was not until the Foundation's volunteer programme became a constant feature of the Rock Garden that the Chandigarh Administration fully began to support the Rock Garden once more and release some of the funds needed to complete this great work. However, the release of funds for the development and maintenance of the Rock Garden is a constant problem. Although it has been agreed that all the entrance money to the Rock Garden is to be spent on works and maintenance, there are often long delays in gaining approval for works and as a result progress at the Rock Garden faces constant frustration. The Nek Chand Foundation continues to raise funds for the Rock Garden, with money being used for special projects that enhance both its development and awareness. A fifteen strong delegation from the Foundation took part in the 25-year Silver Jubilee celebrations of the Rock Garden in 2001 where Nek Chand was feted and praised by a string of Government officials. 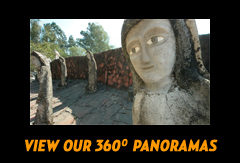 Almost 15000 people thronged the Rock Garden to witness the opening of a series of ‘laughing glasses’ - fairground mirrors shipped to Chandigarh from London at Nek Chand's request as a gift from the Foundation. Thousands formed long queues that wormed their way slowly to the mirrors, only to break out in howling laughter, creating a sense of pure joy that was well at ease in this magical environment. The Foundation Volunteer Programme now sends a group to the Rock Garden several times each year. Living in the Rock Garden in a mosaic guesthouse under a high waterfall, originally built for Nek Chand's guru and his disciples, volunteers spend their time cleaning, repairing and constructing new sculptures and mosaics. As funds trickle in, the Third Phase of the Rock Garden slowly nears completion. One of the world's largest ever mosaic projects is now in progress, with work being carried out by international volunteers, children, unskilled labourers and squads of soldiers sent to the Rock Garden to learn techniques to be used in making mosaic sculpture gardens at Indian army bases. The story of the Foundation so far has been one of success and it has been instrumental in not only pressurising authorities to honour their pledges to support the Rock Garden but, through its Volunteer Programme, also being able to show by example. The volunteers are now a frequent presence at the Rock Garden and the international interest and involvement in this great creation is plain for all to see. The Foundation is always happy to hear from anyone offering support or wishing to apply for the volunteer programme.